When I was travelling through Thailand a couple of years ago, I took part in a wonderful cooking course in Chiang Mai. At the very start, we went round a huge local market, oogling at all the exotic fruits and vegetables, trying to identify various shapes of dried seafood and generally being quite overwhelmed by the myriad shapes and colours and smells. It was wonderful. We picked up what we needed for the class from smiley Thai grandmothers and went on our way to the kitchen. 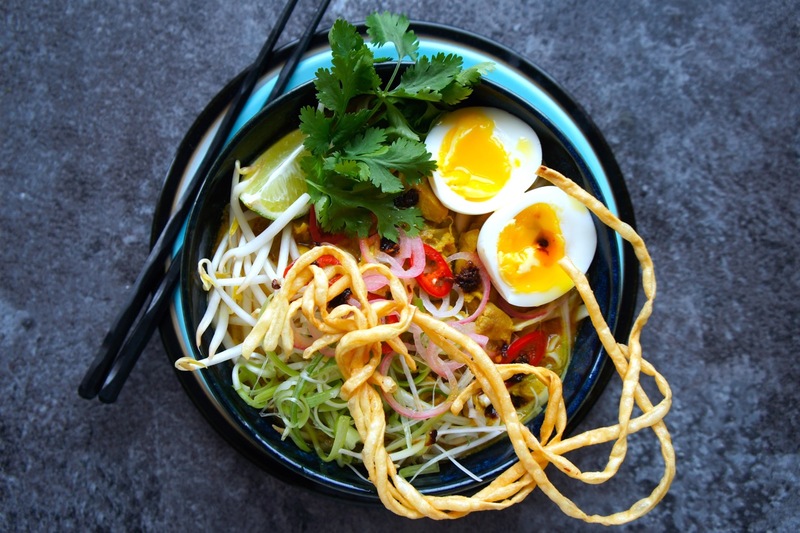 One of the recipes we made that really blew my mind was Khao Soi. This is a Burmese- influenced street food, served widely through Northern Thailand and especially traditional in Chiang Mai. It became my staple. In the cooking class we made our own curry paste and of course had easy access to the most wonderful fresh spices, however, I imagine the majority of us don’t have this kind of wonderment on our doorstep and might need a helping hand from a pre-made curry paste. Hence the adaption below. 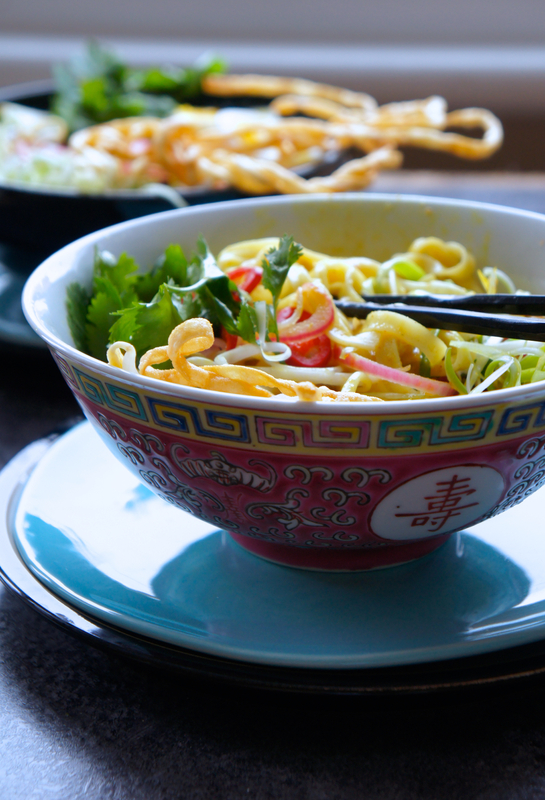 One thing the Thai do beautifully, is adding a combination of flavours and textures to a dish that turn it from a lovely noodle dish, into a party in a bowl; the chili oil, the pickled chili and shallot, the crispy fried noodles… it all makes the dish. Don’t leave them out. The egg is optional, but I love it. It isn’t part of the traditional recipe, but having become a little obsessed with ramen recently (and all things noodly, let’s be honest), I’ve been experimenting with different flavours and additions – and a perfectly boiled egg (not my timings, Ivan Orkin’s) can only make things better. You can leave the egg of if you wish, but you’ll be missing out. Bear in mind it IS spicy, so if you want to reduce the spice, add less (or no) chili flakes and go light on the pickled chilis and onion. 1. PICKLES & SPRING ONIONS: Boil your full kettle. Now make your pickles: finely slice your chillies and shallot/onion and put them in a little bowl or a jar. Add your rice wine vinegar and large pinch of salt and toss. Leave to pickle while you make the rest. If you can do this a few hours in advance – even better! If you want beautiful, curly spring onions – slice your spring onions into very thin matchsticks and put them in a small bowl of ice water. After about 10 minutes, the spring onions will start to curl! 2. EGGS: If you’re having eggs on your dish, make them now. Prepare a large saucepan (you don’t want egg overcrowding) of rapidly boiling water. Pierce your eggs on the fatter side with an egg piercer or a pin Add them to the water and put the timer on for 6 minutes 10 seconds. Stir the eggs for the first minute or so in the water so they cook evenly all round. Prepare a bowl of ice water whilst the eggs are cooking. Once the timer goes off, lift your eggs out of the water with a slotted spoon and plunge them into the ice water. Give them a stir and leave them there for 15 mins or so to fully cool. Don’t drain the water, you can re-use for noodles. 3. CURRY: Have your ingredients ready – open your coconut milk tins, prepare your chicken stock, juice your limes and measure out your fish sauce, curry powder, chili flakes & curry paste. 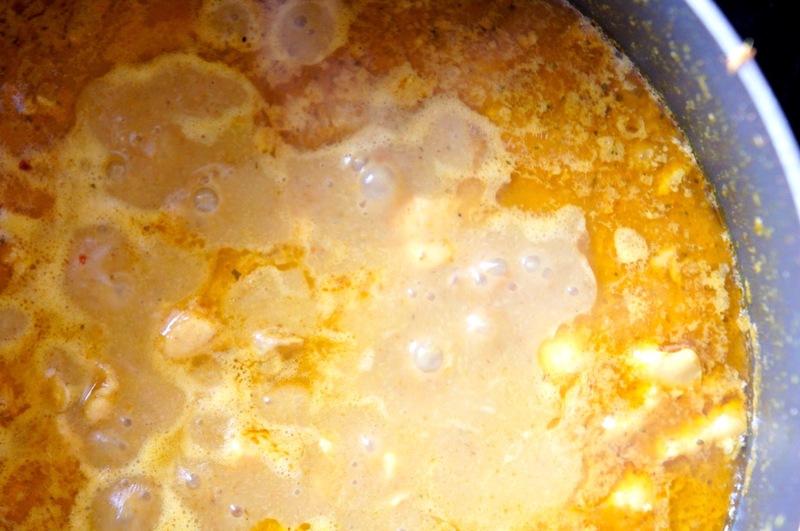 Heat a tablespoon vegetable oil in a large saucepan on a high heat. Add the 4 tbsp yellow curry paste and turn the heat down. Cook the curry paste for a few minutes, then add the curry powder and chilli flakes. Continue cooking for a minute or so then add the coconut milk, coconut cream, stock, fish sauce and lime juice. Bring to a simmer and add the bite size chicken pieces. Lower the heat so it’s just simmering and cook the chicken pieces for 15 minutes or until cooked through and tender. 4. NOODLES: Whilst your curry is cooking, make your noodles. 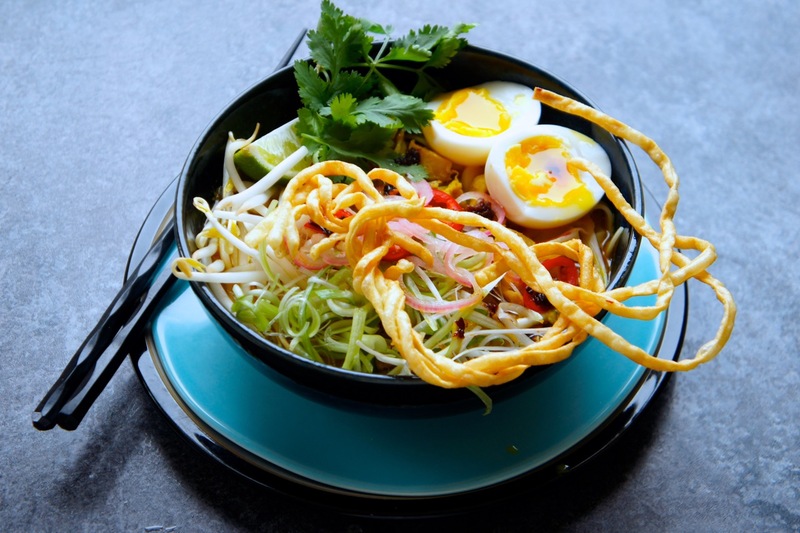 Bring a large saucepan of water to boil (you can use the water from boiling the eggs) and add your dried egg noodle nests. Cook for only 2 minutes until tender and drain. Rinse in cold water until all the noodles are cool. Separate out about 170g – 200g noodles for frying and put the others aside. 5. FRYING NOODLES: Prepare a plate with a sheet of kitchen towel. Heat your vegetable oil in a wok or a saucepan on a high heat. 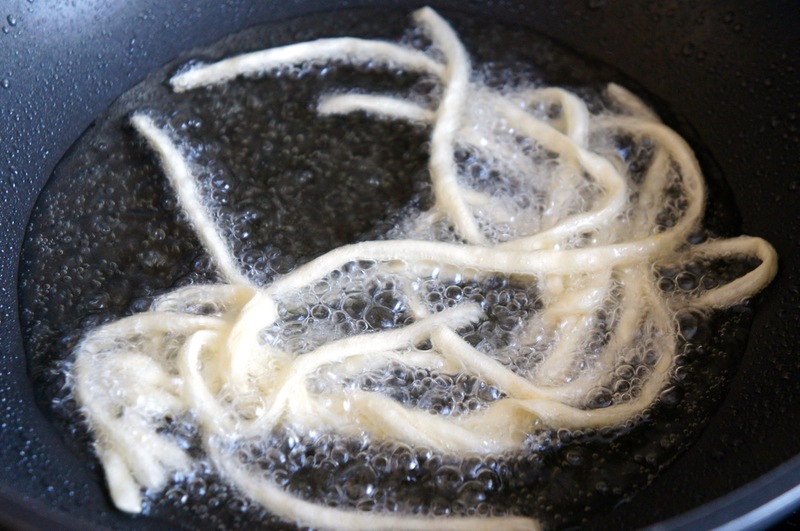 When the oil is very hot and almost smoking, add the noodles for frying in small batches. 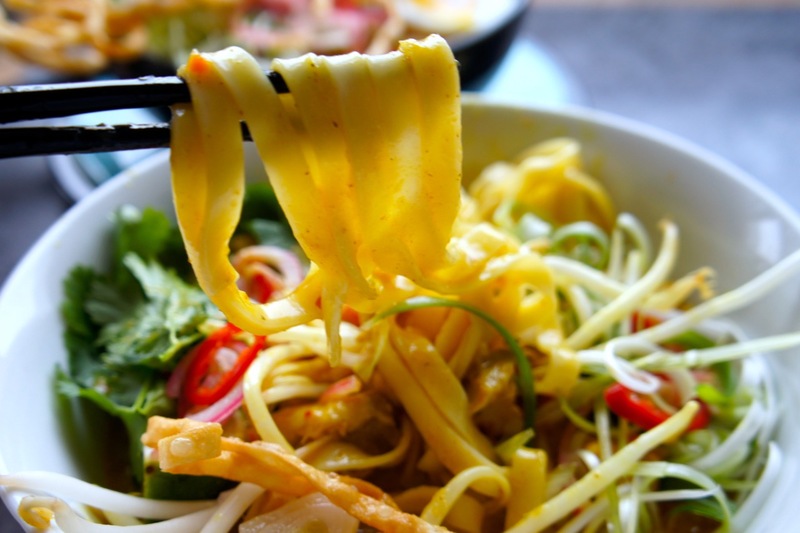 Using tongs, turn the noodle nests over until lightly golden and bubbly all over. Remove to your prepared plate. 6. MAKE THE BOWL: Once the curry has been bubbling for 15 mins and the chicken is just tender, you’re ready to go. 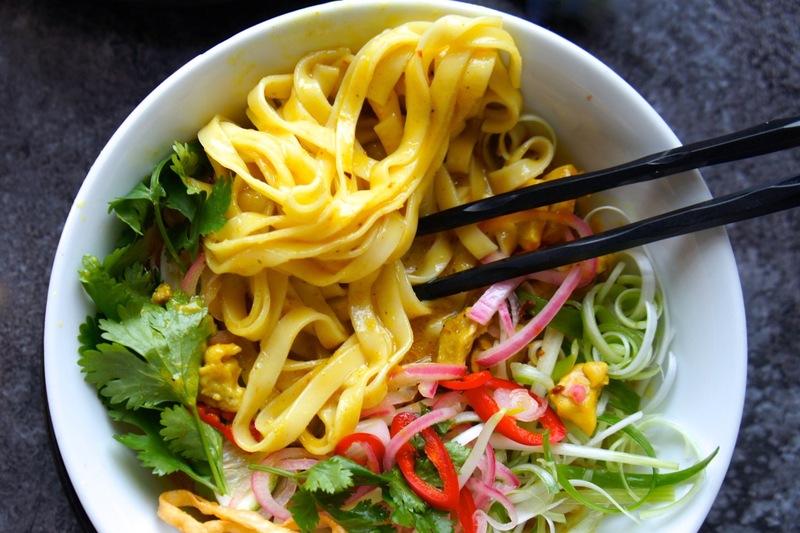 Divide the soft noodles out between bowls and top up with the chicken curry. If you’re using soft boiled eggs, peel your eggs and using a thin sharp knife, carefully slice them in half. 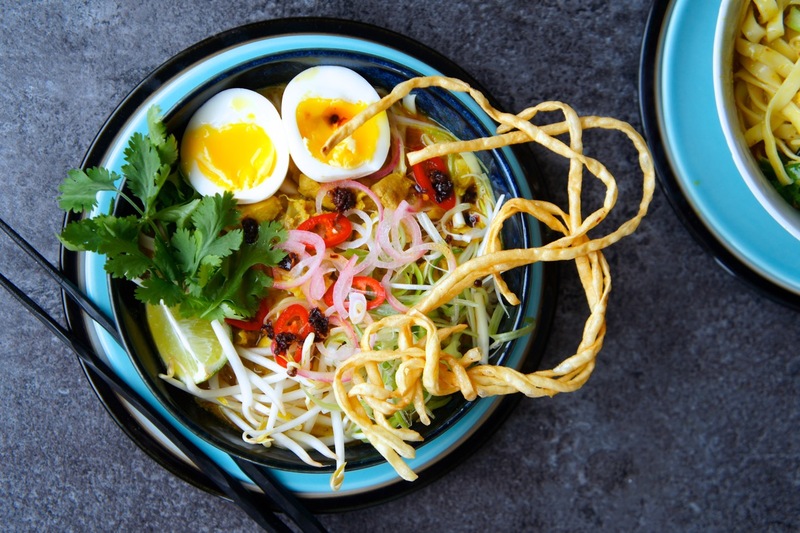 Top each bowl with a handful of beansprouts, some curly spring onions, a few coriander leaves, some chilli and shallot pickles, a dash of chili oil, a lime wedge and of course your a crispy fried noodle nest. If you so wish, you can even add cucumber match sticks, crispy onions and toasted sesame seeds – the bowl is your oyster!